Dingoes as Pets, Is It Legal To Keep A Dingo As A Pet? Dingoes can make loving and loyal companions if cared for in the right way. However, it is common for people to underestimate what it takes to properly care for a pet dingo. It is more time consuming, expensive and harder than caring for a dog. Because of this, many owners end up surrendering their dingoes. They can be difficult to re-home and are then put down. Dingoes are naturally quite shy. They will form a strong bond with their master and be reluctant to spend time with strangers. This makes them seem unfriendly and can be difficult in social situations. They do not like to be alone for too long so require regular interaction, attention and stimulation. Without this, they can become stressed and behave badly. Because they are prone to boredom and their high prey drive, dingoes are likely to escape and cause damage. They don’t adapt to new environments well. If you move house regularly, a dingo is not for you. They also cannot be placed in boarding kennels so it can be an issue if you go away on holidays regularly. 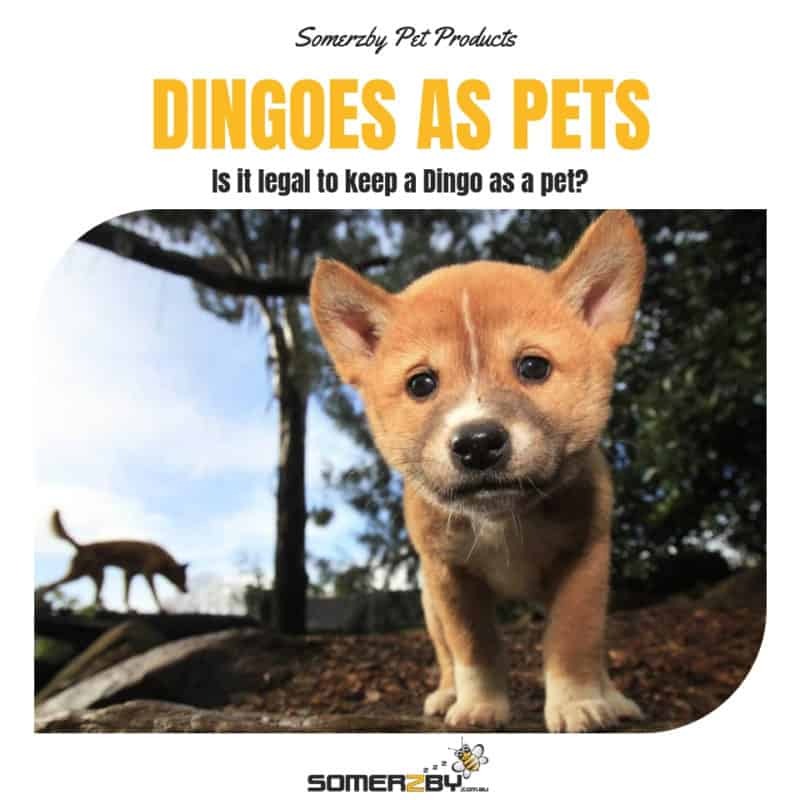 Dingoes cannot live with pet cats, birds, small animals (rabbits, guinea pigs etc.) or livestock. Many dingo rescues will allow you to come in and spend time with their dingoes before deciding to adopt, to make sure they are the right choice for you. Can You Keep a Dingo as a Pet? Always check with your local government regarding rules for keeping pet dingoes in your area. Pet dingoes, like dogs, must be registered and microchipped. It is illegal in Australia to remove a dingo from the wild and attempt to keep it as a pet. Australian States where people can keep pet dingoes without any permit. Australian States where permit is required. Australian States where it is illegal to keep a pet dingo. Similar to pet dogs, pet dingoes need to be vaccinated against parvovirus, hepatitis and distemper. They also need to be regularly treated for fleas, heartworm, roundworm and tapeworm. Dingoes have short, soft coats. They shed their undercoat in the warmer months. You will need to regularly brush you pet dingo to remove loose hair. Dingoes are a native and iconic Australian dog breed. Dingo and domestic dog crossbreeds are commonly found. The popular Australian Cattle Dog is part dingo. Australian dingoes are descended from Asian wolves. It is believed they were introduced to Australia between 5,000 and 10,000 years ago. Wild dingoes are culturally valued by Australian indigenous people. Dingoes are also important in controlling populations of wild kangaroos, foxes, feral cats, rabbits and pigs. Dingos live for 15-20 years. They are the size of a medium dog and can grow to over 20kg. They have a similar appearance to domestic dogs, with some main differences – they are more muscular, have a thicker neck, a longer snout and a bushy tail. Their coat can be light ginger, brown, creamy white or black. Dingos are carnivores, meaning they eat a meat-based diet. Wild dingoes eat native animals they hunt such as possums, kangaroos and wombats. Domestic dingoes can be fed high quality commercial dog food. They can also be fed raw, meaty bones. Pet dingoes require special enclosures to keep them safe. A yard check is usually required before adoptions are approved. Your dingo must have an area of 30m2. The larger the area, the happier your dingo will be. It is recommended you have a fence that is 2.2m high OR 1.8m high but with a full roof or 45 degree inward facing 60cm over-hang. Your dingo will also require a weatherproof sleeping area. Somerzby dog kennels will help keep your dingo protected and comfortable. The Somerzby Haven is study, rot resistant and easy to clean. Dingoes are generally quiet animals. They will sometimes howl, particularly if they are bored or lonely. They do not naturally bark. However, some dingoes living with domestic dogs have learnt to make a similar sound. Dingoes are very active and require high levels of exercise and stimulation. Dingoes with excess energy are likely to develop behavioural problems in captivity. You should walk your dingo for up to 10km per day, to simulate what it would do in the wild. Dingoes must always be walked on a leash, with a hardness, even in ‘off leash’ dog areas. Provide your dingo with activities including hiding food in its enclosure, using Kongs and puzzle toys, and giving it large beef bones to chew on for hours. Training a dingo is similar to training a dog but more difficult. Training will need to be regularly reinforced. Whilst dingos are smart and learn quickly, they also quickly forget learnt behaviour and get distracted. The earlier you begin training, the easier it will be. Consistency and patience are essential. Praise your dingo when it does the right thing and say “no” firmly when it doesn’t. Never hit or scream at it. It is vital to show the dingo you are dominant and the leader of the pack. Always be in control of the situation. When you walk your dingo, insure you walk ahead and it walks behind or beside you. Eat before it eats. You decide when playtime begins and ends. Where Can I Buy a Dingo? You can buy a dingo for $300-450 under an adoption program from Organisations such as Sydney Dingo Rescue and Dingo Den Animal Rescue, these centres offer rescue and adoptions for displaced dingoes. This typically includes desexing, vaccinations, microchipping and training advice from professionals. This entry was posted in Dogs and tagged dingoes as pets, is it legal to keep dingoes, keeping dingoes, pet dingoes.